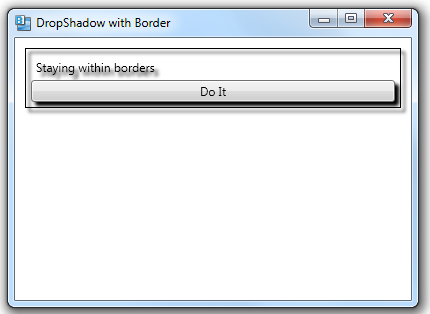 I described earlier how you can use two sibling Border elements to end up with the effect of a Border with a DropShadow. We did this because specifying a DropShadowEffect for a Border will lead to all of the child elements contained in the Border getting the same drop shadow. A cleaner way to avoid the drop shadows on the child elements is to just specify a value for the Background property of the original parent Border, so that it becomes opaque. <Border Margin="10" BorderBrush="DarkGray" BorderThickness="1" CornerRadius="4"
You can get some nice effects by using the combination of a gradient fill for the background along with a drop shadow.